This listing is for the Walt Looking Back pin ONLY from the Walt Disney Suitcase pin set #90828. This listing is for the Walt with Mickey Plush pin ONLY from the Walt Disney Suitcase pin set #90828. 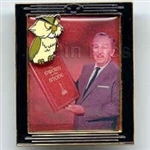 This listing is for the Walt Leaning Forward pin ONLY from the Walt Disney Suitcase pin set #90828. This pin resembles a vintage suitcase with a black and white photo of Walt in the middle. Walt is leaning over a desk and resting on his elbows. On the desk are animation drawings of some sort. This listing is for the Walt Looking Forward pin ONLY from the Walt Disney Suitcase pin set #90828. The Disney Parks 2018 Booster Set is a 5 pin set made up of round pins featuring different Disney Park Icons. This small circular pin features a black silhouette of Walt and Mickey from the Partners Statue Attraction on a blue background and the year 2018. Enameled cloisonné, Silvertone finish, Each pin: 1 1/2'' Diameter. Created especially for Walt Disney World Resort and Disneyland Resort. Open Edition pin at Walt Disney World in honor of Walt Disney's 100 Birthday. It is black with an orange WD in Walt font at the top. Orange leaves run up the side. The center contains a picture photo of Walt Disney. On the bottom left is a 3D Mickey with hands clasped, gazing up at Walt Disney. Along the bottom it says "December 5, 1901" and "The Man and His Dreams." Similar to the D23 2015 Partners pin, this pin is sold at Official Pin Trading Locations. It is behind the counter, and you may have to ask to see it. It is only for D23 Members, and you need a membership card to get it. It is another 2015 D23 pin. This is a hinged oval with four shades of blue on the face. On the inside of the pin on the left is 2015, on the right is the Storytellers Statue embossed. This copper pin is hinged. On the cover is a relief of the Sleeping Beauty Castle from the Main Street point of view with clouds in the background. When opened you will find a quote: "It's kind of fun to do the impossible" and Walt Disney's signature on the top half of the pin and a picture of Walt in a room with art work or other framed items on the walls behind him. Disneyland 60th Anniversary - World of Color Celebrate! This pin looks like a Cast Member nametag, and says "Walt" where the CM's name would be, with "Share a dream come true" written where the CM's Magical Memory would be. The little hump at the top of the pin shows the 100 Years of Magic logo. This is second in a series of 6 pins to be released throughout the year at the Disneyland Resort in celebration of Walt Disney's 100th Birthday. This pin is a black/white photograph of Walt in front of a model of the Matterhorn. The MK castle is in front of Walt. Behind Walt is a storyboard for the construction of the Matterhorn. 115867 Disneyland 60th Anniversary - World of Color Celebrate! Disneyland 60th Anniversary pin featuring a photo of Walt Disney in black and white framed by a Mickey Head icon. The words "World of Color Celebrate!" are in gold colored script on a white background over rainbow colored stripes. Pin is made of gold colored metal; back of pin features the D60 stamp, the 2015 Authentic Official Disney Parks Pin Trading logo, © Disney, Made in China and FAC-000122-15280. Tinker Bell is pin on pin and appears to be sprinkling pixie dust on Walt Disney. Tinker Bell's wings are glitter-filled. The circular picture of Walt Disney is covered in an epoxy type coating. Walt Disney's trademark signature is featured across the bottom. Little gold stars are on the outside white rim on the right hand side of this pin. This open stock rack pin released during the Epcot Pin Event features a circular black and white picture of Walt in the center of the pin and Mickey riding a horse playing polo in 3D on the right of the pin. The words Walt Disney are underneath the picture. The fourth limited edition pin in the "Walt 100th" series, this pin features Walt with the Tiki Room Parrots. The third limited edition pin in the "Walt 100th" series, this pin features Walt at the drivers' seat of a car with the Disneyland logo on the door. First in a series of 10 to celebrate Walt's 100th birthday. This is an antiqued (bronze)brass-style replica of his first business card. The card shows Walt (drawn by himself) working at an artist's easel. In black filled engraving the card reads, "Walt Disney Cartoonist. Comic cartoons, advertising cartoons, animated motion picture cartoons." This pin is fifth in the twelve of the With Walt Series celebrating his 100th Birthday. It is a black and white photograph of Walt standing inside a door frame with Mickey's shadow on the door. There is no 3D pin on this framed pin. Pins in this series include: #9082, #9481, #10407, #10977, #11028, #11598, #12679, #13141, #15314, #16108, #16637, #18075. This pin is a photograph of Walt Disney by himself leaning out of a cab window of one of the many locomotive trains found at DLR. The photo is black and white and placed in a red frame. It celebrates the Disney Holiday, Walt Disney Day of 2018. Celebrate Walt Disney Day on December 5, 2005 with this Limited Edition pin. This oval-shaped pin features a picture of Walt Disney with Mickey Mouse, Goofy and Donald Duck as a pin-on-pin. Mark Seppala from Disney Design Group created the artwork for this pin. Walt Disney Day was first established by President of the United States Ronald Reagan on December 5, 1986. Adding Walt's Birthday for search purposes. Commemorate Walt Disney's award winning achievements in the entertainment industry with this Limited Edition pin of the month collection. This is the first Limited Edition pin in the Walt Disney Award Winning Performances Series and commemorates the 1932 award for the creation of Mickey Mouse that Walt Disney received. Mickey is featured as a pin on pin. This pin is seventh in the twelve of the With Walt Series celebrating his 100th Birthday. It is a black and white photograph of Walt reading a book with a chimpanzee/monkey looking over his shoulder. It reads, "Of all our inventions for mass communications, pictures still speak the most universally understood language. There is no 3D pin on this framed pin. Pins in this series include: #9082, #9481, #10407, #10977, #11028, #11598, #12679, #13141, #15314, #16108, #16637, #18075. This pin is tenth in the With Walt Series celebrating his 100th Birthday. It is a black and white photograph of a younger Walt reading a book. The pin reads "Everyone Has Been Remarkably Influenced By A Book, Or Books." Pins in this series include: #9082, #9481, #10407, #10977, #11028, #11598, #12679, #13141, #15314, #16108, #16637, #18075. This is the last in the series of the Walt With pins. It features Walt Disney sitting at a table with figurines of characters from the movie Pinocchio. Pinocchio is also a pin-on-pin on the top left corner of the pin. Figurines are: Pinocchio Jiminy Cricket Geppetto Figaro Gideon J. Worthington Foulfellow Stromboli Pins in this series include: #9082, #9481, #10407, #10977, #11028, #11598, #12679, #13141, #15314, #16108, #16637, #18075. This limited edition pin was released to commemorate Walt Disney Day in 2015. It features a hinge that opens up to display a picture of Walt Disney. Inside the hinged cover reads "Walt Disney Day 2015"
Walt Disney left a lasting legacy in film, television and Disney theme parks around the world. This collection of pins celebrated his legacy and the many happy memories he created for people everywhere. A new pin was released each month during the series. This Disney television show aired from September 14, 1969 to September 2, 1979. It later returned to the air on the ABC television network on September 28, 1997. This Limited Edition pin #12 features Tinker Bell as a pin-on-pin presenting a stylized television with Walt Disney and the "Wonderful World of Disney" logo. The building skyline is also a pin-on-pin. This pin was designed by Artist Lin Shih from Disney Design Group. This listing is for the Event Logo Pin released at the 60th Anniversary event at DLR. This sculpted metal spinner pin features the event logo, a drawing of the Partners statue with Walt Disney and Mickey Mouse on one side (Gold, White and Blue) and “The Happiest Place on Earth” featured on the reverse (all words are blue on a white starry background, except the word Happiest which is printed in gold). Disneyland 60 is printed at the top on the non-spinning element. 1.5” W x 1.75” H. Designed by Ximena Romero. This is the 11th in the Walt Disney Scroll Quote series of pins. This is again in pewter and the quote is: "I have learned from the animal world, and what everyone will learn that studies it is, a renewed sense of kinship with the earth and all it's inhabitants." and signed Walt Disney. This is the 8th in the Walt Disney Scroll Quote series of pins. This is again in pewter and the quote is: "Never get bored or cynical yesterday is a thing in the past." and signed Walt Disney. This is #5 in the Walt's scroll quote series. The quote reads, "All the adversity I've had in my life, all my troubles and obstacles have strengthened me." This was given to only EXCEPTIONAL cast members. This is a cast exclusive from the cast recognition program at Disney, Partners in Excellence is 10 K gold. Has a silhouette image of Walt Disney holding hands with Mickey Mouse. Disney cast members who qualified to win the highest award bestowed upon a cast member by the Walt Disney Company. Very few people won this award-a true collector's piece can only be won once in a life time!